State Park Fundraising Update - Thank you! More than $1.14 million in generous donations to Texas State Parks has been received since we appealed for help two months ago. Hundreds of donations have been received from individual donors, as well as a significant donation of $500,000 from the Texas Parks and Wildlife Foundation and a $250,000 gift from the T.L.L. Temple Foundation. Now as the weather warms to spring, one of the best ways to help state parks is to visit them with your family and friends. Almost 50% of the parks' operating budget comes from visitor fees, including the sale of state parks passes. For only $70, a State Parks Pass waives daily entrance fees for everyone in your vehicle for a whole year. The $4.6 million fundraising campaign was triggered by a budget shortfall created by heat, drought, wildfires and a drop in park visitation. The 40-page digital publication features a 2012 fishing forecast by TPWD staffer and long-time outdoor writer Steve Lightfoot as well as a figurative tackle box full of topical articles aimed at making your next fishing trip enjoyable and productive. 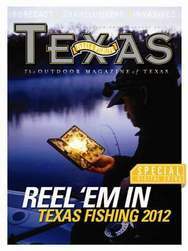 You get the same full, rich content and breathtaking photography you expect from Texas Parks & Wildlife magazine with lots of interactivity, including instructional videos and links to helpful agency information on all kinds of fishing topics. Best of all, you can view it conveniently with your computer, tablet or smart phone. If you go out in the east Texas woods, you may be in for a surprise. There have only been 120 bear sightings reported in Texas since 1978, but you have a slowly growing chance of seeing one, thanks to habitat restoration. In this video, hopeful conservationists, students and landowners describe their efforts working with Texas Parks and Wildlife biologists on behalf of black bears. Don't worry. 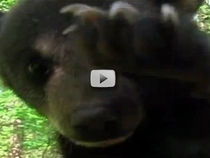 Bears are normally shy and not aggressive to humans. Read more in this brochure about how to bear safety in mind. Report bear sightings to Texas Parks and Wildlife 1-800-792-1112. Observe wildlife. Watch birds. Learn to camp. 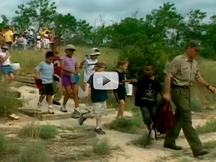 Three of the greatest spring activities to try in Texas State Parks! Now is the time to set some dates on your calendar to launch you and your family into the Texas outdoors. • March: Discover the wildlife of Texas! Finding wildlife has never been easier — you can explore a Great Texas Wildlife Trail or use the calendar of events to find a wildlife viewing event at a state park near you! Use these easy-to-follow tips for insight from experienced behavior watchers. • April: With over 630 species of birds, Texas is one of the top birding destinations in world! State parks offer great birding, but there are plenty of birding events and opportunities throughout Texas. Try some of these Kid Activities to get the whole family engaged! • May: Learn camping basics with your family. 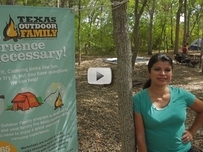 Take a Texas Outdoor Family Workshop, held at state parks throughout the year to help teach you and your family how to camp. Try geocaching, fishing and more. The $65 per family fee includes camping equipment. Learn what to expect with this video, and then find an event near you. Or, if you have a family of seasoned campers, visit our state parks reservation page and plan a trip to enjoy your favorite state park! One of the longest outbreaks of Red Tide in Texas history may be letting up in some areas along the coast but not in time to save this season's $30-million dollar Texas oyster industry. The commercial oyster season that would have begun on November 1 and run through April 30 was initially suspended indefinitely. Only in the first week of February have a few areas been opened to shellfish harvesting. 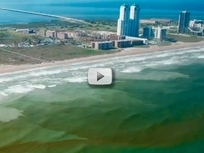 Watch this video about the red tide in the Texas Gulf and keep up with the red tide status on this web page. The 2010 BP oil spill and 2008 Hurricane Ike destroyed 60 percent of the oysters in Galveston Bay. Now the ongoing drought is causing high salinity levels in Texas bays and disease in many shellfish. One shining light - oyster reef restoration efforts continue and unharvested oysters today will have a chance to filter out toxins and spawn in the spring. Red tide is usually not harmful to humans, but it can harm pets. Keep them away from effected beaches to prevent respiratory difficulties, and do not allow them to eat dead fish from beaches. Report dead or dying fish and wildlife or pollution threatening fish and wildlife to the 24 hour Communication Center for TPWD immediately at 1-512-389-4848. Turkeys are popular with hunters and birdwatchers alike. (Spring turkey season is right around the corner in 28 east Texas counties April 15 through May 14). How can these big birds tell us what they need to thrive? Try some high tech turkey talk! This video shows how biologists use a big net and some very tiny backpacks to study Rio Grande turkeys. With the help of private landowners, Texas A&M University and the Texas Parks and Wildlife Department are using the latest in trapping and tracking technology to learn about Rio Grande turkey habitat in South Texas. Catching poachers, wrestling wayward alligators, rescuing boaters . . . your average reality show has nothing on the adventures of Texas game wardens who specialize in law enforcement off the pavement. This video, “How to be a Game Warden in Six Easy Months,” offers a glimpse of how cadets are trained. Follow the true adventures of state game wardens through the online Game Warden Field Notes. Kris Bishop, Assistant Chief of Fisheries Enforcement for Law Enforcement, outlines the steps involved in becoming a Game Warden in this Passport To Texas radio interview. These commissioned peace officers lead the way in conservation enforcement, patrolling the lands and waterways of their communities and enforcing fishing, hunting and boating safety laws. And their “to-go” bags are always packed to help in a disaster situation. 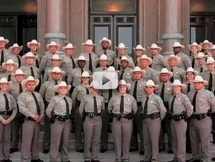 Learn more about how to become a game warden on the TPWD website. Out of the dry textbook and into the Gulf! A savvy science teacher revs up student learning by using Galveston Island State Park as an outdoor biology classroom, with State Park staffer Hans Hagland helping out. “Those people at state parks have got the education, they know the environment and the critters," says biology teacher Mike Furrey. Watch science come off the page in this video as teacher and students share some hands-on learning. The outdoors also come to life for some students who have had little experience in the natural environment. The result? Fresh interest among students in science and math and a spotlight on possible career paths. If you are a teacher interested in bringing a class out of doors, contact the state park you'd like to visit about interpretive staff availability. For information about sponsored group discounts, call Customer Service at 512/389-8900. Will you and your boat be good to go when Texas waters warm up? Got boater ed? Anyone born after Sept. 1, 1993 and looking forward to operating a motor-powered vessel, sailboat or personal water craft on Texas public waters needs to have completed a state-approved boater education course. Prior to passage of the new law, only boat operators ages 13-17 had to take a boater education course. Read more detail about the new law in this recent news release. Texas’ state-approved boater education courses are available as one-day classroom training or online. The classroom course takes about six hours to complete and the online course has a three hour time commitment. One-time costs start at $20 for both courses. Find more info and the schedules of upcoming classroom courses on this web page. You can update your subscriptions, modify your password or email address, or stop subscriptions at any time on your Subscriber Preferences Page. You will need to use your email address to log in. If you have questions or problems with the subscription service, please contact support@govdelivery.com. All other inquiries can be directed to webcomments@tpwd.state.tx.us. This email was sent by Texas Parks and Wildlife Department using GovDelivery, the contracted email service provider of the Department. This service is provided to you at no charge by Texas Parks and Wildlife Department.